If there’s one thing I really love about exploring the many treasures of the App Store, it’s that you can find tons of proof for the idea that great games can come from simple, clean designs. It’s something video gaming used to live by, back in simpler times, and while I enjoy a big, expensive, complex blockbuster like everyone else, I’m genuinely more impressed with games that excel on the back of a clever design, and that’s just what Hoplite ($2.99) does. Part rogue-like, part turn-based strategy, Hoplite may not have the frills of some other games, even within the generally spartan genres it straddles, but the way it cuts to the heart of what makes those types of games enjoyable is beautiful. 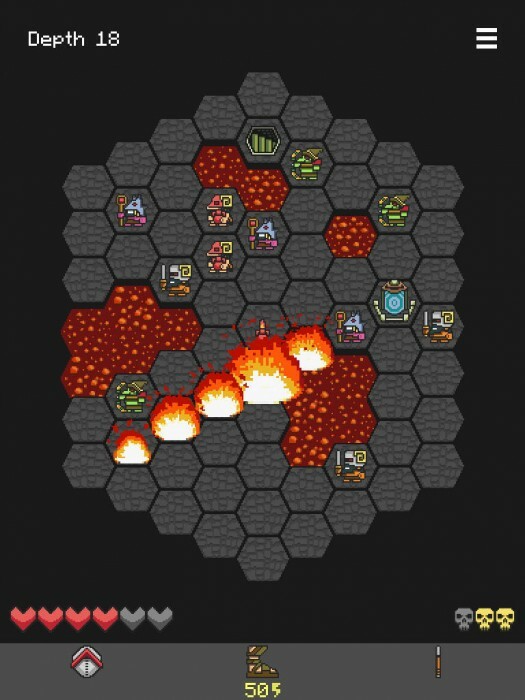 In Hoplite, you play as a hoplite tasked to recover the Fleece of Yendor from the underworld. That’s pretty much all the story you’re going to get, but it’s motivation enough. The game even tells you which floor the fleece can be found on, floor 16, so you know right from the start where your goal lies. Of course, if you’re courageous enough, you can go deeper. Who knows what you might find? Probably death. That seems likely. Each floor is made up of a single-screen field broken into hexagons. The layouts are somewhat random, with each one containing things like lava, various enemies, and shrines. On each level your task is simply to reach the stairs. Killing enemies is fun but optional. It’s a good idea to visit the shrines, however, because praying at one offers many potential benefits. Basically, it’s a rogue-like of the turn-based variety, but it doesn’t quite have everything you usually see in that genre. For example, there is no random loot to be found. While praying at the shrines can augment your abilities and increase your hit points, your hoplite’s abilities throughout the game are all there from the start. You can move onto any non-lava hex, attack certain adjacent enemies, use your sandals to jump over a square, throw your spear for a ranged attack, or shield bash one adjacent enemy or object. The sandals have limited uses, so you’ll want to be careful about using them, and if you throw your spear, you’re going to have to go and pick it up from where it lands before you can attack again. The shield bash has unlimited uses, but it has a cooldown, so you won’t be doing that every turn either. With those abilities, you need to fend off any enemies and hazards that come your way. Key to the strategy is that the hoplite can’t always attack an enemy just because they occupy a neighboring hex. Simply moving beside an enemy doesn’t always translate to an attack. There are a few ways to go about taking out enemies, but you either have to charge in straight-on, or get beside them and then move to another adjacent square. It’s kind of weird at first, but you’ll get the hang of it. With each move you make, the enemies will get a move as well, though you have the advantage of going first. If an enemy successfully attacks you, you’ll lose a heart. You start the game with three, and if you run out, well, it’s a rogue-like in that regard, too, so you’ll be back to the start without any of your upgrades. There’s a wide assortment of enemies that will try to do you in, all with different ways to attack you. Touching an enemy shows its attack range, valuable information that you need to pay attention to when you’re taking your turn. If you position yourself right, you can even use some enemy behaviors to your advantage, such as the demon bomber’s habit of tossing bombs that blow up his allies just as well as you. As you go deeper into the underworld, new enemies will appear, and things get pretty hectic in a hurry. Luckily, thanks to the turn-based nature, you’ve got all the time in the world to consider your strategy, and individual enemies have fairly predictable patterns. Still, when there are a lot of bad guys on the field, trying to find the safe way through can be very challenging at times. On those occasions when you can find a really smooth way through a pack of foes, it’s an incredibly satisfying feeling. As I mentioned before, praying at the shrines found in each level allows you to improve your abilities in various ways. Using a shrine will bring up a list you can choose only one from. Exactly what’s on offer depends on the god the shrine is associated with, but you’ll always have the choice of expanding your life bar or fully healing yourself. Other possible augments will improve your various abilities in some way, such as reducing cooldown or extending the range of attacks. Generally, these shrines are your only way of healing, so you’re often choosing between becoming more powerful or giving yourself the ability to take more punishment. Both will help you survive, but it’s a hard call sometimes as to which one will extend your life longer. Hoplite also includes a list of achievements, but unlike other games, these aren’t just for show. Unlocking them will open up powerful new abilities you can choose at the shrines in subsequent playthroughs. Some of these achievements are very hard, but having a tangible reward connected to them makes the effort to reach them truly feel worthwhile. The graphics are very simple but serve the purpose. Every enemy is visually distinct, and you can see the whole field at all times. Indicators showing where the enemy can attack are clear. The piece of music that plays during the game provides good atmosphere without being overbearing, which is vital when you only have one tune. The game provides an excellent tutorial that teaches you how everything works, and the user interface is simple and intuitive. Although the game includes achievements, there’s no Game Center support, which is a shame, because at its core, this is a score-attack game, and those always shine with leaderboards. There’s not much more to say about Hoplite. That’s perhaps one of its strengths. It’s very simple to learn, but there’s a huge amount of depth to the game. If you like rogue-likes, turn-based strategy games, chess, 868-HACK ($4.99), or shield-bashing bombs at demons, you’ll definitely want to give this a go. It’s been very well-received in our forums, and deservedly so. Hoplite is a fantastic example of the benefits of a concise, clever design, and it’s one I expect to keep on my mobile device for some time to come.